Denard Robinson discuss his decision to return to the Michigan under new coaching staff. The college football season is slowly coming to an end. But before it’s over we still have numerous conference games that must determine the beast from the sheep. This weekend there are several games that are definitely going to start to make the picture a little clearer. Below is a preview for Maryland Terrapins vs Florida State Seminoles, Nebraska Cornhuskers vs Texas A&M Aggies, Virginia Tech Hokies vs Miami Hurricanes, Stanford Cardinals vs California Golden Bears, Ohio State Buckeyes vs Iowa Hawkeyes, and Wisconsin Badgers vs Michigan Wolverines game. After a whole offseason the Michigan Wolverines quarterbacks didn’t know who would be taking snaps under center, well in their case behind center in shotgun. With just 24 hours till kickoff, Michigan Head Coach Rich Rodriquez notified Denard Robinson that he will be the guy. The sophomore QB was thrill to hear he was the starting QB. He didn’t disappoint either. In Saturday’s game against UCONN, Robinson ran for 197 yards, setting a school record for a QB, and a TD. And he threw 22 passes with 19 completions for 186 yards and a TD. Known as the creator of the spread option Rich Rodriquez knows the qualities of a spread QB. 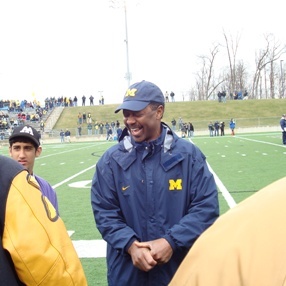 At West Virginia University Rodriquez was the coach of Pat White, the NCAA all time leading rusher among QB’s. And he might have found his Pat White 2.0 in Denard Robinson. After the game both head coach and player sported huge smiles in the post game interview on ABC.